Born and raised in Illinois, Katie White attended Northern Illinois University where she received her Bachelor of Fine Arts. 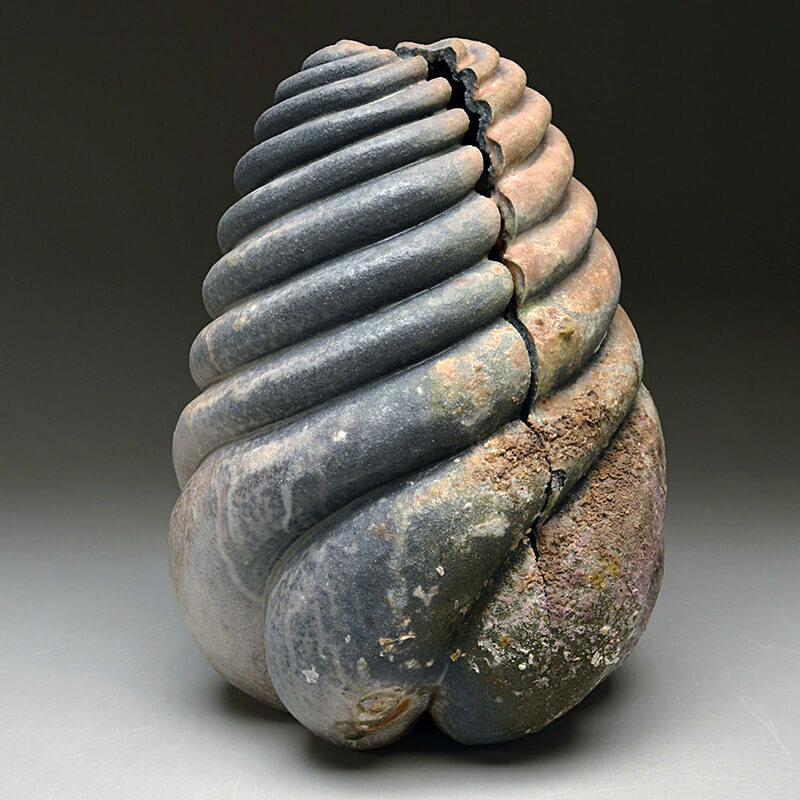 Her work ranges from functional utilitarian work to delicate, organic sculptural forms. Currently Katie resides and Wichita, Kansas where she continues to create beautifully detailed pieces. The Spiral itself is one of the oldest symbols. It represents change, progression, growth, and development. The egg is an obvious symbol for beginning and is also associated with ideas of fertility, regeneration, and immortality. For the past few years, I have been obsessively making a form that combines these two symbols. This form was inspired by seed and egg shapes found in nature. I have made hundreds of these eggs in different sizes, out of different clays, and in different types of firings. Concentration is no longer needed when carving the pattern. I can pick up a ball of clay in any size and begin shaping and carving and my mind is free to wander in a type of meditation. A larger piece must be sliced in half, hollowed out, and reunited. Recently, I have been writing thoughts and secrets on the inside walls before reattaching the halves. They are each a little incapsulated record of what I was thinking at the time. Their inner thoughts will never be known unless some sort of disaster occurs. I prefer to fire in soda, salt, or wood kilns since the smooth surfaces and deep groves are accentuated in atmospheric situations. In a way, the egg is like a seed and the spiral is the force that generates its transformation into something else. When placed amongst one another, instant relationships emerge. The repetition and increase in scale implies a sense of eternity or, at least, a sense of future. It forces the viewer to consider what will come next. The use of this common form evokes a desire to create narrative. Where do they originate? What do they become? When the egg is whole, there is a mystery about what the interior holds. When the form is split, it seems that the contents have escaped and we are left looking at an empty shell or skeleton. Overall, I wish to create a calm and soothing environment that is balanced and alluring where the viewer’s mind is free to wander and drift away with their own interpretation.